This episode of Youpreneur FM marks the end of our month-long celebration of the official launch of the audiobook version of my bestseller, Rise of the Youpreneur. Interested in winning a year’s membership to the Youpreneur Academy? All you have to do is download the audiobook and leave a review over on Audible. Then, email a snapshot of your posted review to my team at support@youpreneur.com, and we’ll add your name and email address to the prize draw! 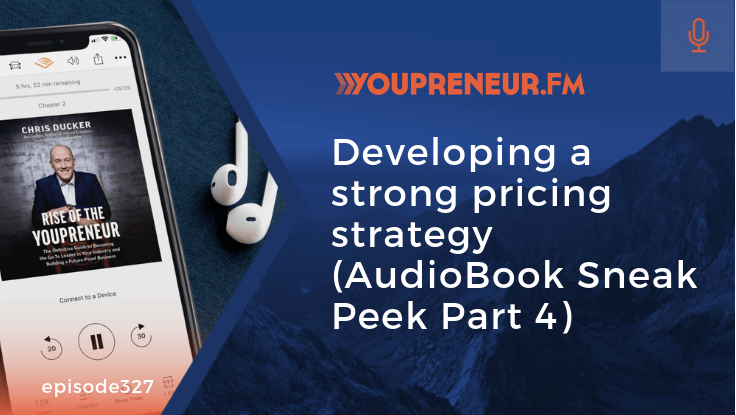 When you tune into this episode of the podcast, you’ll hear a sneak peek inside chapter 11 of my audiobook, where I deep dive into how you can develop a strong pricing strategy. You’ll also learn four ways to test out your next “big idea” to ensure that the launch of your new product or service is as successful as possible.